Haven’t decided on a hotel yet? You can look at other available hotels in the Nord-Pas-de-Calais region with Booking.com. Constant invasions across the centuries, culminating in some of the most bloody battles of the 20th century, have put this region at an unfair disadvantage. Its heavy industrialization and dense population are not exactly holiday attractions. But don’t be so eager to go somewhere else should you find yourself here. There is a lot of historical attractions to see, as well as unspoiled countryside and sandy beaches. Investment initiatives have brought culture and art to its cities and towns. Best of all, because the region isn’t on the main tourist paths, the attractions never seem overwhelmed, and with some charming, family-owned castle hotels on offer, you’ll be rewarded with a unique, personal experience. Calais This busy port has more to offer than a queue to get on or off the ferry. 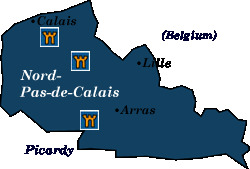 For over 200 years Calais belonged to England, and with several million British visitors passing through each year, you might wonder if you’re indeed in France. A couple of sights worth seeking out are the Musée des Beaux Arts, which holds Auguste Rodin’s famous statue The Burgers of Calais, and the Musée Mémoire 1939-1945, a blockhouse containing exhibits that recount the story of Calais during the war. Dunkerque A lively university town, major port, and massive industrial center, Dunkerque will forever be remembered as the site of the dramatic evacuation of 350,000 Allied troops in 1940. Begin your visit at the Mémorial du Souvenir, a private museum that helps set the scene of Operation Dynamo. At the Musée Portuaire, you can learn about Dunkerque’s maritime history through film footage, ship models, and panoramas. Boulogne-sur-Mer The medieval walls of the ville haute presents an impressive sight, and the Old Town within offers cobbled streets, the 19th-century Basilique Notre-Dame, and a 12th-century belfry atop the Hôtel de Ville. Astonishingly, the largest collection of Greek and Etruscan artifacts outside the Louvre in Paris is at the Château Musée. If you’re traveling with children, the popular Centre National de la Mer, otherwise known as Nausicaá, is a huge ocean center with tanks filled with sharks, eels, rays, penguins, and sea lions. St-Omer A trading center for over 1,000 years, this attractive Flemish town features lots of architectural surprises: the 13th-century Cathédral Notre-Dame, which features an astronomical clock and an 18th-century organ, and the charming 18th-century Hôtel Sandelin that houses a fine arts museum. 12 km north of St-Omer, at Éperlecques, is the “Blockhaus,” a German concrete bunker that was built to launch V2 rockets against the UK. And 5 km southwest of St-Omer is La Coupole, a highly informative WWII museum housed inside a bunker that relates the story of the Nazi occupation of northern France, the use of prisoners as slave labor, and the technology behind the V2 rocket. Montreuil-sur-Mer No longer on the sea, but 13 km inland, this hilltop town has excellent views from atop its medieval ramparts. Cobbled streets wind past restaurants and 17th-century houses. A citadel designed by famed military engineer Vauban features a 14th-century tower with the coats-of-arms of the French nobility killed at the Battle of Agincourt. For fans of Les Misérables and Victor Hugo, who used to vacation here, Montreuil is where Jean Valjean was mayor and the location of his factory where Fantine worked before forced into prostitution. Lille More than a Eurostar stop, Lille offers architecture, good restaurants, and a university. The old city of Lille (Vieux Lille), especially, is worth a wander along its cobbled lanes that wind past boutiques, galleries, and cafés. A museum not to miss is the Musée des Beaux-Arts, which is filled with paintings by Delacroix, Rubens, Courbet, and Monet. Also, the house where French president and general Charles de Gaulle was born in 1890 is now a museum. The Maison du Général de Gaulle presents artifacts from his life and puts on special exhibitions. Arras This charming Flemish town was renowned for its medieval tapestries—one of which was mentioned in Shakespeare’s Hamlet. The town was damaged during World War II, but excellent reconstruction efforts have preserved much of its historic atmosphere. Especially well done is the two cobblestoned squares containing 155 unique façades of baroque architecture. A 15th- 16th-century belfry is listed as a UNESCO World Heritage site. Just 8 km north of Arras, Vimy Ridge was the site of some of the most brutal trench warfare of World War I. Here you can wander past lines of trenches that give a sobering lesson about the horrors of war. The French government has given the entire area in perpetuity to the Canadian people, whose Canadian Corps suffered over 10,000 casualties. Crécy and Agincourt Battlefields 1 km northeast of Crécy-en-Ponthieu you can find a watchtower known as the Moulin Édouard III. Worthy of a visit if you wish to stand on historic spots, otherwise there’s not much to see, it was here where Edward III defeated the French in 1346 during the Battle of Crécy. It was the first time the six-foot English longbow was used on the continent, as well as the first appearance of gunpowder. 12 km northeast of of Hesdin, the Battle of Agincourt was fought in 1415. Again the armored French knights were routed by the lighter and more mobile English archers. The Agincourt Centre Historique Médiéval recounts this pivotal day of the Hundred Years War.